In Zennestraat 17, the former laboratory of the Ministery of Economic Affairs, a temporary artistic hub was opened in April 2009. During BRXLBRAVO, a cross-over of contemporary work from all disciplines will be presented. Several workspaces will join forces with the resident organizations, to inject a supplementary dose of experimental art. The platform arts-lab.be will display an artistic cartography. 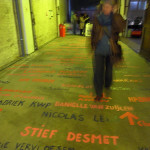 This mapping will also break free from its walls: Artist Walks will guide the public from Zennestraat to BelleVue, another unique venue temporarily converted into a ‘creative brewery’, and the intersection between both locations, the Ninove Gate, will be an area of unexpected artistic interventions. PARTICIPATING ARTISTS – Lotte Van den Audenaeren (installations)- Boutique Vizique: “[stop]Kontakt” (interactive installation)- Shila Anaraki, David Helbich, Mark Knoop, Tom Pauwels & Tomma Wessel: “Letter Pieces” (performance pieces, composed by Matthew Shlomowitz) – Sebastian Dingens & Michiel Vandevelde: “D’Afrique” (installation/performance)- Filip Gilissen: “The winner takes it all” (installation)- Olivier Toulemonde: “Empty factory” (soundinstallation)- Hans Bryssinck & Diederik Peeters, Hans Bryssinck & Christoph Hefti & Peter Podworski, Alix Eynaudi & Agata Mazkiewicz, Manah Depauw & Jen Debauche, Kris Verdonck, Irma Firma (films)- The Enslaved Hamster (interventions)- Anne-Sophie de Visscher, Claudio Stellato, Halory Goerger, Arnaud Boulogne, Delgado Fuchs (videos)- Geluidpost: ‘Stereo_Sport’ (hans w. koch) (soundinstallation)- Stief Desmet, Manor Grunewald, Tom Kok, Lawrence Malstaf (expo)- Marcos Simoes: “Punch Line Decision” (video installation)- Marcos Simoes with Varinia Canto Vila & Christophe Albertijn: “Laughingame” (performance)- Ariane Loze: “MÔWN” (short movies)- Michel Yang: Scar Stories (one-to-one performative meetings)- Einat Tuchman & Gosie Vervloesem: “Maïzena” (performance)- Wendy Van Wynsberghe: “Softwearables” (interactive installation)- Karelle Ménine: Le Hamac (soundinstallation)- Marta Kucza, Marie Géhin & Annemie Maes (seminar)- The Wild Classical Music Ensemble (concert)- Fia Cielen, Jan(us) Boudewijns, Wannes Lecompte, Michiel Ceulers, Jan Verbruggen, Francis Denys, Aukje Koks (expo)- David Evrard, Zin Taylor, Sofie Haesaerts & collective Anne Bossuroy, Jean-Daniel Bourgeois, Jonathan Dewinter, Gérard Meurant & Jonas Locht (open studio’s)- Sylvie Macias Diaz, Heidi Voet, Saddie Choua, Isoje Chou: “Time to Destination” (expo). A CO-PRODUCTION OF Bains Connective, Constant, Croxhapox, De Pianofabriek Werkplaats, FLACC, Galerie Fortlaan17, Het Entrepot, Josworld, Komplot, L’L, Lokaal01, Margarita Production, nadine, Q-O2, SECONDroom, SoundImageCulture, WP Zimmer. OUTSIDE-PROGRAM BY Koen Moerenhout, Lotte Van den Audenaeren, Marthe Van Dessel, Claudio Stellato, Christina Clar, Nataska Roublov, Irma Firma, David Helbich, Laïa Sadurni, St. Air, Start XXI. Saturday 3 October 2009 Sunday 4 October 2009 Expo from 10 am until 6 pmPerformances from 2 pm until 5 pm.